June 10th, 2008 : Sunny and Hot, Water Temp 86* and clear. Got out early this morning and caught about 300 Herring , picked the guys up at 5:30 and went fishing. Stripers were scattered a bit this morning early and we set up on a couple of smaller schools before I located 3 very large schools where we all had some fun. 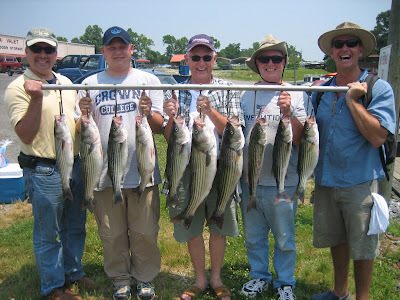 Today we had well over 250 strikes , I lost count of how many fish we boated but the guys took home a few fish for dinner. Michael felt sorry for his fish and released most of his! 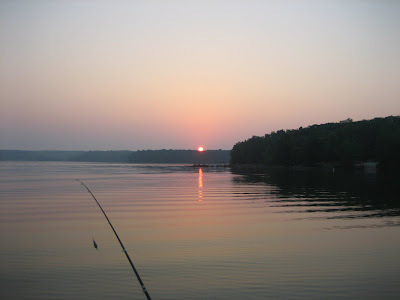 The beginning of a wonderful day on Lake Anna.